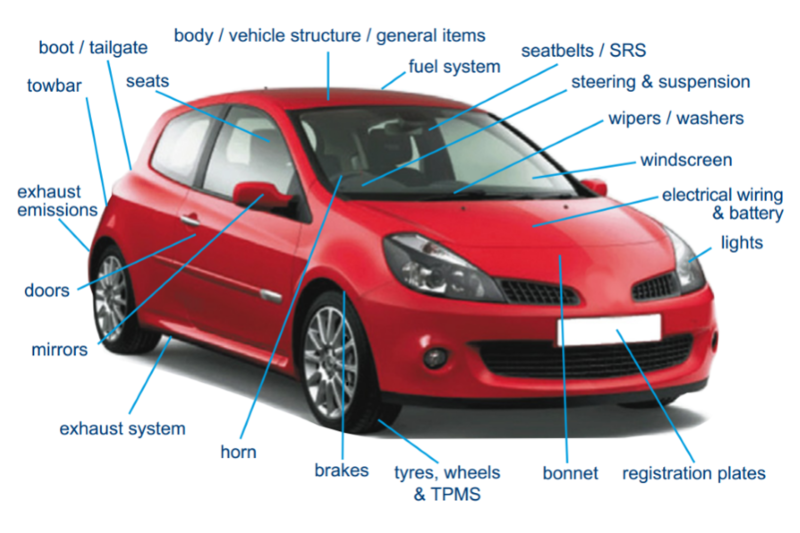 An MOT is an annual examination of a vehicle that is three years old or more. The MOT tests both the safety of your vehicle and the level of emissions in the exhaust. The Vehicle and Operator Services Agency (VOSA) is responsible for ‘licensing’ both the MOT test station and the MOT tester. The MOT confirms that at the time of the test and without dismantling it, the vehicle meets the minimum acceptable environmental and road safety standards required by law. It doesn’t mean that the vehicle is roadworthy for the length of time the certificate is valid. The MOT certificate is also no guarantee of the general mechanical condition of your vehicle. The test doesn’t cover the condition of the engine, clutch or gearbox. Your MOT can be done up to 1 month before it is due; this is to give you time to have any repairs done before the old certificate expires.nMost vehicles need their first MOT when they are three years old, then annually. A registration plate problem. For example, the plate showed the incorrect type face/spacing, or was dirty or missing altogether. If you have a personalised plate, make sure it follows DVLA rules. Stickers on the windscreen blocking the driver’s view. Make sure that anything stuck to the windscreen, including tax disc and parking permits, is outside the wipers’ sweep area. Our 6 month interim service includes a vehicle health check, oil change, oil filter and top up of all levels. Our 10,000 mile full service includes a vehicle health check, oil change, oil filter, air filter, spark plugs, top up all levels and a wash.
Our major service is perfect for high mileage users and includes a vehicle health check, change oil, oil filter, air filter, fuel filter, pollen filter, spark plugs, top up all levels and a wash.
How long does an MOT check take? The average MOT test should last approximately 45 minutes. While the test is taking place you should be able to remain at the garage, if you wish to do so you’ll be able to oversee the range of checks being carried out by the technician. If you have no serious issues requiring correction then a pass certificate known as the VT20 can be awarded, although a VT30 means the test has been failed. As long as it has a re-test carried out within ten working days then a pass certificate can still be obtained. If there are any problems that need to be resolved but that do not prevent a pass, a VT30 can be designated. You can get the vehicle tested at any time – however if you want to preserve the existing expiry date you can come in up 29 days beforehand. E.g. if the expiry date is 27th December, the first day you can book is 28th November. This ensures you have plenty of time to book a convenient test slot before the existing certificate expires. I don’t know my vehicle’s MOT class? Most cars will be Class 4. Motorbikes are Class 1 (up to 200cc) or 2 (over 200cc, including with sidecar). Motorhomes and most smaller vans are Class 4 too. Vans/goods vehicles of 3 to 3.5 tonne are Class 7. We strive to deliver a superior experience. with our fully equipped workshop with up-to-date diagnostic equipment and fully qualified technicians.